The Laughing Kookaburra is instantly recognisable in both plumage and voice. It is generally off-white below, faintly barred with dark brown, and brown on the back and wings. The tail is more rufous, broadly barred with black. There is a conspicuous dark brown eye-stripe through the face. It is one of the larger members of the kingfisher family. Identification may only be confused where the Laughing Kookaburra's range overlaps that of the Blue-winged Kookaburra, in eastern Queensland. The call of the Blue-winged Kookaburra is coarser than that of the Laughing Kookaburra, and ends somewhat abruptly. The Blue-winged Kookaburra lacks the brown eye-stripe, has a blue tail and a large amount of blue in the wing, and has a pale eye. Laughing Kookaburras are found throughout eastern Australia. They have been introduced to Tasmania, the extreme south-west of Western Australia. 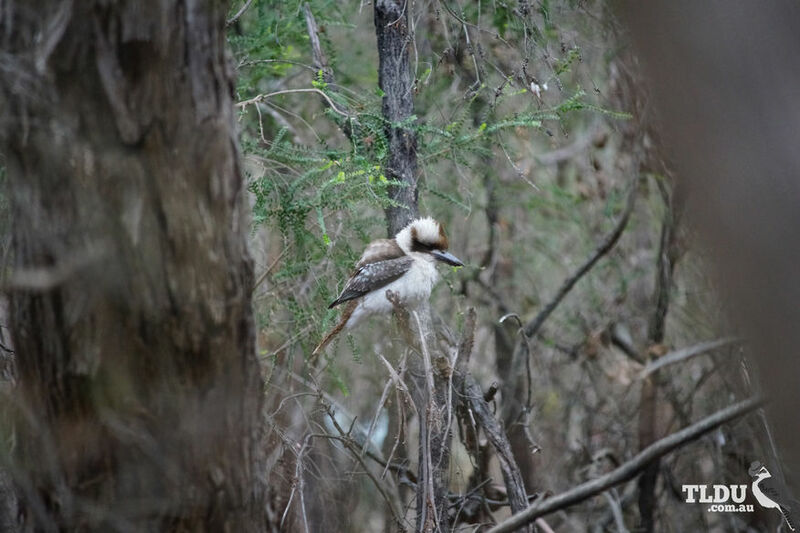 Replaced by the Blue-winged Kookaburra in central northern and north-western Australia, with some overlap in Queensland, although this species is more coastal. 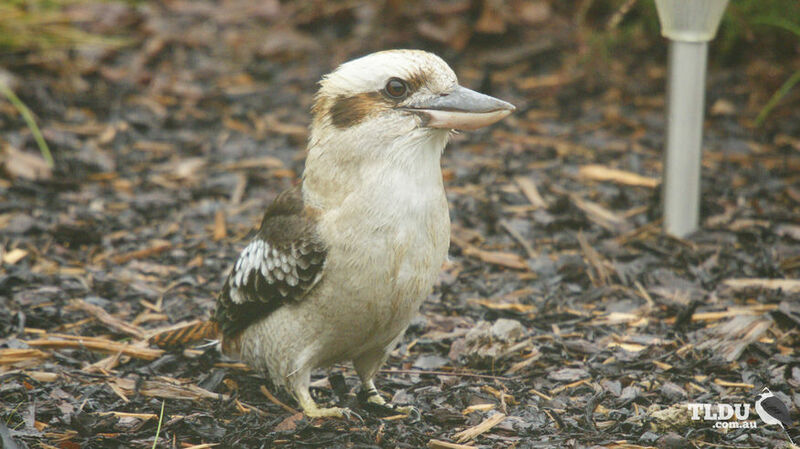 The Laughing Kookaburra inhabits most areas where there are suitable trees. Laughing Kookaburras feed mostly on insects, worms and crustaceans, although small snakes, mammals, frogs and birds may also be eaten. Prey is seized by pouncing from a suitable perch. Small prey is eaten whole, but larger prey is killed by bashing it against the ground or tree branch. Laughing Kookaburras are believed to pair for life. The nest is a bare chamber in a naturally occurring tree hollow or in a burrow excavated in an arboreal (tree-dwelling) termite mound. Both sexes share the incubation duties and both care for the young. Other Laughing Kookaburras, usually offspring of the previous one to two years, act as 'helpers' during the breeding season. Every bird in the group shares all parenting duties. The Laughing Kookaburra is not really laughing when it makes its familiar call. The cackle of the Laughing Kookaburra is actually a territorial call to warn other birds to stay away. Laughing Kookaburras often become quite tame around humans and will readily accept scraps of meat. This 'pre-processed' food is still beaten against a perch before swallowing.